For the 5th year, Kassandra Dimaggio has put on the Patriot's Day endurance rides outside of Greenville, California. She added a 100-miler in 2007, saw that it could be done, and began her work for the National Championship this year. 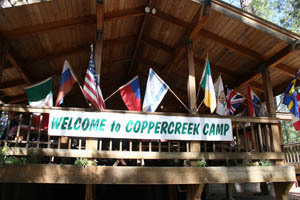 Basecamp is at Coppercreek, a private family-owned and operated summer camp - ample meadows for parking; cabins; a large kitchen and dining area; showers; swimming pool (with frigid water! 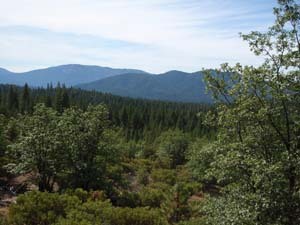 ); petting zoo; and, most important, access to hundreds of miles of trails and logging roads in the Plumas National Forest, and over some privately owned lands. Every year the proceeds of the ride go local charities, and to the Veterans Guest House of Reno, a "home away from home" for US military service veterans receiving outpatient treatment, and for families of veterans who are hospitalized at medical facilities in the Reno/Sparks area. The community of Greenville and the surrounding area turns out en masse to volunteer for the ride - many have been working with Kassandra for two years to make these National Championships happen. If that wasn't challenge enough, she took on the added labor of making both the 100 and the 50 FEI rides also, to help riders get their horses qualified, or get their COC's for the World Championship in Kentucky in October of 2010. 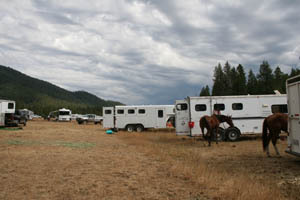 Ridecamp was already packed with horse trailers by Wednesday afternoon. The first person I see is Naomi Preston, from Baker City, Oregon, who runs up to me and says, rather frantically, "We have an extra horse - can you ride?" (Of course I brought my helmet and chaps and Raven, just in case...) "YES! Oh - wait - I'm not qualified on your horse!" "Gotcha! We know how you like to get on strange horses at the last minute and do rides!" Oh, darn! I'd had my hopes up for a few seconds there. (And I could have ridden a horse I wasn't qualified on, for mileage, and not placement.) Naomi would be riding Karlady in the 100. 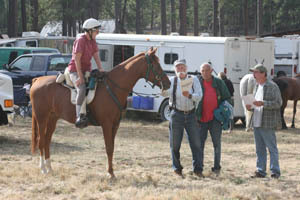 Her husband Lee brought his horse Mr Turner along to keep Karlady company in camp and at the start of the ride, but Lee would be crewing, not riding. "It's MY turn to ride this time!" Naomi said. 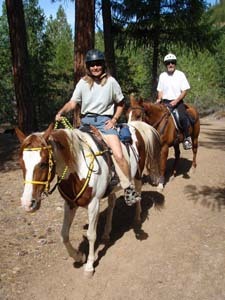 And on Thursday morning I hadn't walked around camp for 5 minutes when Lisa and Shel Schneider from Agoura, California, asked me to take a spin on the trail with them to exercise their third horse. Sure! What better way to get a look at the condition of the National Championship trails? And the trails were in good shape: well marked by "The Trail Marking God" Dave Rabe (Kassandra said at the ride meeting, "Ray Charles wouldn't get lost on these trails! "), and challenging (some strenuous climbs, long downhills, some rocky trails, twisting trails, a good amount of hard-packed logging roads). I got to ride the Schneiders' lovely 18-year-old horse Drew, who Lisa would be riding on Sunday in the 50 miler. That's after she rode the 100 tomorrow on PR Tallyrand (a younger brother to Michele Roush's PR Tallymark). Shel would ride Barney in the 50 on Sunday. Drew's done it all with their daughter - halter, gymkhana, English and Western pleasure: "You can put a 7-year-old on him." He's not too shabby at endurance either: over 2500 miles, and 78 finishes in 84 starts. Shel got started in endurance because it was something he could do with his wife. He'd always been athletic, so when Lisa asked him if he could ride, he said Sure! He'd been on a rental horse before. You know, the kind you kick and yeehaw and the horse does nothing but walk. He got on Lisa's Arabian, gave it a kick, and fell off backwards when the horse yeehawed down the trail. And since then, "It's been a humbling experience - for 12 years!" 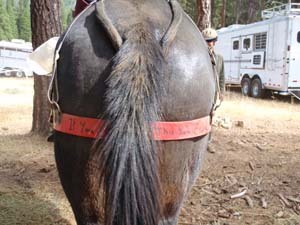 Endurance riding tends to do that to you. 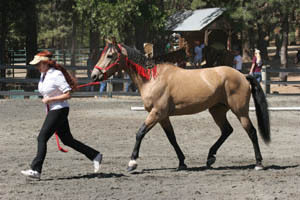 Connie Creech, from Carson City, Nevada, brought her mare LS Shardonney Bey to ride in the 100. Less than 4 months ago, Connie didn't know if she'd ride her ever again. She'd brought both her horses to the Owyhee Fandango at the end of May. As she was riding LS Steele Breeze in the 100, Shardonney was tied to the trailer - awaiting her 50 mile ride the next day - when somehow she got her head caught under the trailer and broke her jaw. Nobody even wanted to tell Connie about it till she finished her 100. Her husband took the mare to the vet clinic where they did surgery and clamped Shardonney's jaw back together. She healed so fast and so well, Connie took her on a 50 mile ride at the Tour de Washooo at the end of August, and she did just fine. And here they were, to attempt the National Championship 100. Brad Green of Woodburn, Oregon, was here with his tough, fast little half Arabian-half Mustang, Pawnee, for the 100. 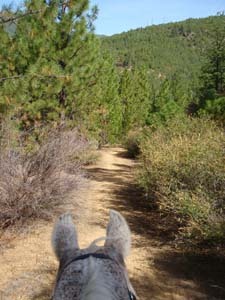 Pawnee was and is Brad's first and only endurance horse when he started riding endurance two years ago. Brad was an Ironman Triathlete, and got interested in endurance when he rode with friends on the weekends. "I didn't know a horse could trot straight uphill over rocks!" His girlfriend - who rides dressage, not endurance - picked Pawnee out on the internet. "I got real lucky," Brad says. Pawnee had done a lot of different things before endurance - jumping, showing; kids rode him. I've noticed that Pawnee is a bit hot at the beginning of endurance rides. "He really is a sweetheart... just a bit crazy on the first loop." The two have been quite successful these two years: 10 finishes in 12 starts, with 4 wins and 3 Best Conditions, and 2 out of 3 100-mile completions (one a third place, one a second place and BC). Jennifer Niehaus and her mom Joyce Sousa from Cloverdale and Hydesville, California, were here for the 100, riding NH Copper Blaze (owned by Ruth Waltenspiel), and LV Integrity. Joyce won't talk about her horse's record out loud ("pride goeth before a fall!") - but I will! And it's not bragging to say that 16-year-old "Ritzy" is an amazing horse who has completed 24 of 26 100's over 11 seasons. It's just the facts. Joyce and Jennifer (with crew husband and father, Dennis, and Ruth Waltenspiel) were here not to win but to complete - and you could expect to see them near the front if the horses were going well and doing their usual pace - because this is just the next step on their way to the WEG pre-ride in Kentucky on October 14th. Max Merlich and his pinto mule Junior - fresh from their July Tevis completion - were here from Oregon as was Lois Fox and Iced Mocha. Carolyn Dawson of Bishop, California - at 70 one of the oldest riders at the event (I hope she doesn't mind me repeating this - which I do because she is not only my adopted aunt, but one of my heroes : ) - was here with her gelding Orzo. They finished the 100 at the Owyhee Fandango in May, and finished 15th in the Eastern High Sierra Classic 50 in August. Canadians Elroy Karius and wife Gail Jewel, and Terre O'Brennan hauled down here from British Columbia, Canada, for the 100. Elroy was riding Apache Eclypse, a horse with a very high opinion of himself. "If he could he'd stop and look at himself in every mirror he passed!" Gail rode Eclypse to a win in the 75 miler at the Owyhee Fandango in May, and he carried Kate Coady to a 9th place finish in the 75-mile North American Young Riders Championship in Indiana in July. 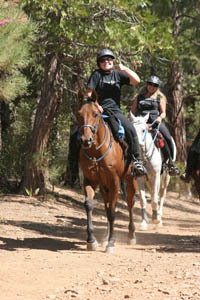 Melissa Margetts came from Florissant, Colorado to ride the 100 on her Paso Fino, Cabo. 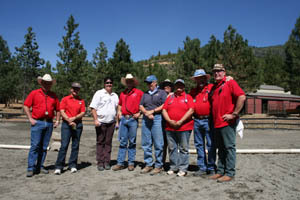 Their last ride was a 38th place finish in the Tevis. Melissa threw me up on Cabo to just ride up and down the road, to see what that gait of a Paso Fino feel like, and it feels like - wow! Smooth as silk. Cabo also plays equine soccer and does the Extreme Cowboy Challenge. 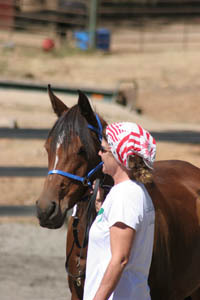 Becky Hart was here from San Juan Bautista, California - not as observing USA Chef D'Equipe, but as a rider in the 100. No Repeat was doing his first 100 - after finishing his first 75 miler with Tennessee Mahoney at Becky's Shine and Shine ride in August. Cheryl Dell and her father would be crewing for her. The rider who came from furthest away to compete was Japanese rider Kiyoshi Ozawa. He would be riding one of Tracy and David Kaden's horses from New Mexico. At the ride meeting, packed with enthusiastic riders and crews, head veterinarian Dr Rob Lydon encouraged everyone to have fun, and reminded them that the veterinarians were there to "HELP YOU take care of your horse." Pulse criteria would be 64 all day. The weather for tomorrow would either be 91* (Kassandra said at the ride meeting), 96* (I checked the NOAH forecast), or triple digits (one rider said). Any way you looked at it, it was going to be a hot day for horses and riders going a hundred miles. A local Maidu Native American spoke to us about the sacred grounds of "the People" that riders and horses would be traversing. Kassandra took the time to thank the volunteers ("I lost count at 60") and all the sponsors for this huge event, without whom this ride couldn't have taken place. A good handpicked group of veterinarians and ride officials were present, and 63 enthusiastic riders were set to hit the trails for the AERC National Championship 100-Miler at 5 in the morning.